Wild salmon just can’t seem to catch a break right now. From bloodwater from farmed fish plants to the anti-spawning mats Kinder Morgan placed along its proposed pipeline route, wild salmon in British Columbia are facing threats from human interference at every point in their life cycle. We can now add exposure to glyphosate to the list. 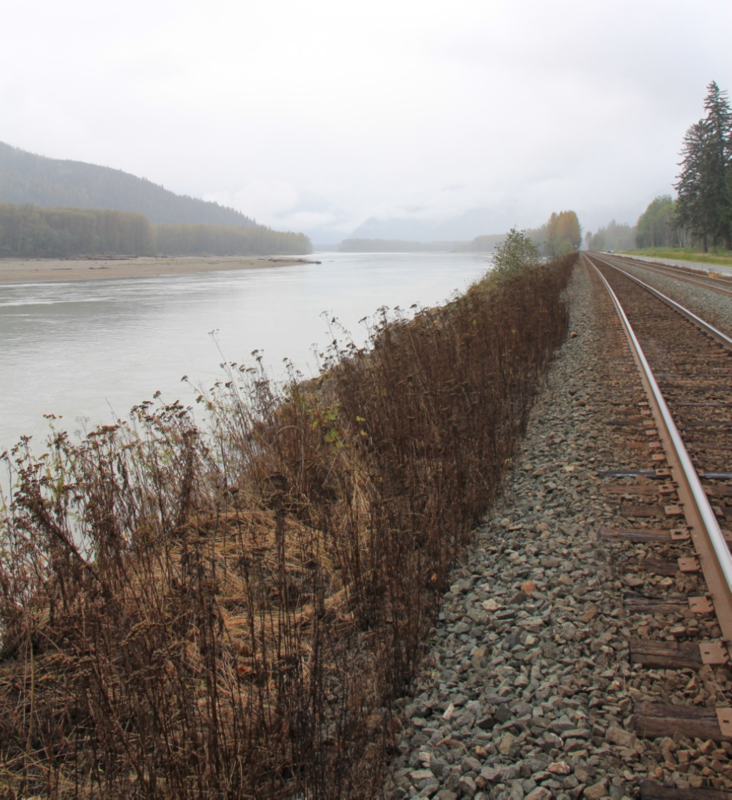 Between July and October 2017, CN Rail contracted a company to spray herbicide containing the chemical glyphosate along the 100-kilometre stretch of track that follows the Skeena River from Terrace to Prince Rupert. The Skeena is the second largest salmon river in Canada and provides rich habitat for many iconic species. Since the herbicide spraying, a ribbon of dead vegetation follows the rail line on both sides, all the way along the river. Luanne Roth, the T. Buck Suzuki Environmental Foundation’s energy campaigner for the north coast, was appalled when she saw the effects of the spraying. The line of dead vegetation went right to the water, despite the fact that there are supposed to be no-spray buffers to protect fish-bearing streams and rivers. Luanne asked the Province to investigate, and she hired an independent environmental consultant to analyze the sprayed area. Her environmental consultant found evidence of glyphosate on plants directly overhanging salmon habitat. BC’s Pest Management Regulation states that generally, a 2- to 5-metre pesticide-free zone must be maintained when spraying glyphosate close to a fish-bearing river or stream. Glyphosate is an active ingredient in many commercial herbicides, including Roundup. It is an extremely potent and indiscriminate agent – it will damage or kill any plant it comes into contact with (unless that plant has been genetically modified to withstand glyphosate application). While there are conflicting opinions from credible scientific sources about the effects of glyphosate exposure on humans and the environment, it is certainly a situation where the precautionary principle should apply: glyphosate is listed as a carcinogen in the state of California, a probable carcinogen by the International Agency for Research on Cancer, and the European Union, while not viewing it as a carcinogen, recognizes it as toxic to aquatic life. The Province of BC has recognized that glyphosates are highly toxic to amphibians. As if this weren’t bad enough, CN did not have legal authority to spray herbicides while this work was done. The company used to have a legally-required Pest Management Plan (PMP), but it expired on May 3rd, 2017 and CN did not renew it. Pest Management Plans as a form of regulation are rather weaker than we’d like – the provincial government generally does not even review them. Nonetheless, without a PMP, CN is only allowed to spray 20 hectares of its railway infrastructure with herbicides. The provincial investigations begun as a result of Luanne’s complaint found that over 1800 hectares of CN Rail’s right of way were sprayed with herbicides in the course of this work, and there were numerous other instances of non-compliance on the part of the contractor. But here’s the real kicker. The Pest Management Plan that CN Rail allowed to expire, the one that would have permitted the spraying of herbicide along the Prince Rupert-Terrace rail line, was for the entire province. The Provincial investigation revealed that spraying on CN rail lines has been taking place all around the province this summer, after CN’s PMP had expired. Some of the places identified in the Provincial report as having been sprayed without a PMP were Fort Nelson, Fort St. John, Dawson Creek, Prince George, Nechako, Bulkley, Telkwa, Skeena, and Lillooet. If CN rail lines or rail yards were sprayed with herbicides in your area after May 2017, it is likely that the spraying was illegal. Luanne received support from our Environmental Dispute Resolution Fund (EDRF) to look into options for legal action against unpermitted activities on the CN rail line. If you think herbicides were applied illegally in your area after May 3rd 2017, you can contact Luanne or the EDRF to learn more about your options.